The art of tea symbolizes simplification, first of all, by an inconspicuous, solitary, thatched hut erected, perhaps, under an old pine tree, as if the hut were part of nature and not specially constructed by human hands. In my column Indigo Blue I talked about how in Japan green is blue. But sometimes of course green is green. Green tea and matcha powdered green tea products are very popular in Japan. You can buy matcha latte drinks and matcha ice cream and even matcha chocolate. I mentioned green tea and ichigo ichie 一期一会 before in my blog post Doumo. Arigatou. Gozaimashita. If you are ever in Kyoto drop in at ran Hotei for some green tea. It's run by a martial artist. In the Daily Yomiuri interview below he talks about Bun Bu Ryo Do 文武両道 ぶんぶりょうどう the way of the pen and the way of the sword - follow them both. It's a nice coincidence because I talked about Bun Bu Ryo Do just last week in my blog article the eleventh hour. It is easy to see the connection between shodo - Japanese calligraphy - and martial arts. In Zen and the Ways by Trevor Leggett there is a striking photograph from the dojo of Omori Sogen Roshi. A man about to write a character is attacking the paper using his brush almost like a sword. 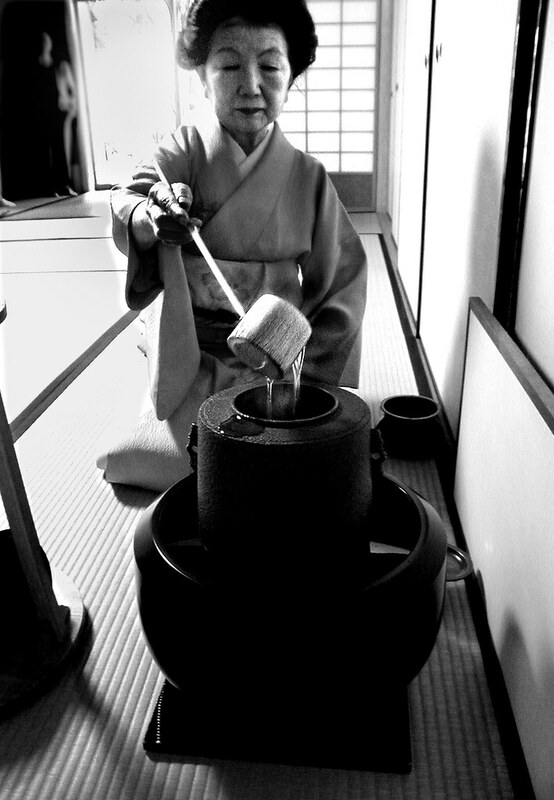 It is much more difficult to see the connection between the tea ceremony and budo. The Japanese tea ceremony can fall into mannered and empty and effete aestheticism. So approaching the tea ceremony as a budoka - martial artist - must give it a vitality and awareness. You can see the zanshin awareness - remaining mind - in the photo above. I used to drink matcha with my first aikido teacher in a tranquil pottery shop and café near the Nippon Budokan. And recently I found some green tea toothpaste. Thanks Carina. I never heard of teaism before.